Purchase The Architects Golf Club driving range cards, range memberships and more, now available online! The Architects features a state-of-the-art 10 acre practice facility with a 30,000-square-foot grass tee box, a turf fairway, bunkers and short greens. Golfers of all skill levels can develop and enhance all aspects of their game at our practice facility and range. Whether you want to warm-up before a round, or work out the kinks of your last one, The Architects Golf Club's practice facility has everything you need to make sure this round and the next are great golf experiences. Shop our range cards and membership offers for savings! 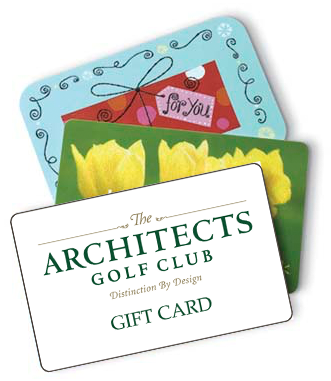 Gift cards make an excellent gift for golfers and non-golfers alike! Consider a gift card for use on anything from golf and pro shop merchandise, to Thyme Restaurant food & beverage purchases. Can't find a denomination that you want? Call the Pro Shop at (908) 213-3080 to place your order. *Gift cards may not be redeemed for cash, or applied as payment to any account. Gift card values will not be replaced if lost, stolen or destroyed.